Is energy-assisted liposuction really safe? Traditional liposuction, even with thick, blunt-tipped instruments, is a safe and simple way of removing fat from the body, through techniques that have been honed and mastered over decades. 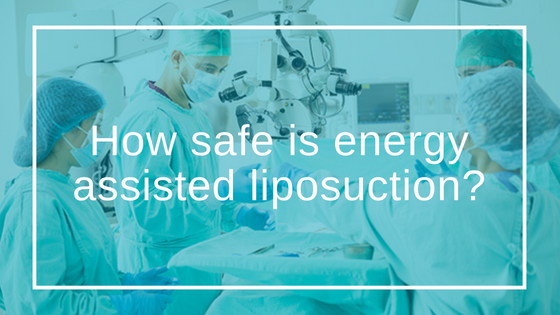 The modern trend of energy-assisted liposuction, whereby the procedure is augmented with heating, goes against many of the principles of safe procedures, introducing considerable risks that could result in permanent damage to the patient’s skin. It may be appealing to robots or those whose bodies that are made entirely of plastic, but for regular humans, there is no need to heat and melt fat through ultrasound or lasers! The technique raises the chance of unwanted side effects through heat damage to the undersurface of skin and is not carried out at our clinic for reasons of safety. One form of energy-assisted liposuction is branded Vaser (Vibration Amplification of Sound Energy at Resonance), but there are others, and it is important to understand what you will be putting your body through should you decide to proceed. One of the most important points to consider is that energy-assisted lipo is a body contouring technique and not intended for anyone looking to lose weight through surgery. A common myth prevails that because the technique is modern and is less reliant on cannulas, it is safer than other procedures such as microlipo, but this is not the case. The potential risks and complications of this procedure include full thickness skin burns, seromas, infections, skin discolouration such as erythema ab lipoaspiration, permanent loss of sensations or numbness in treated areas, disfigurement, and unevenness through lumps and bumps. There is a huge amount of data and evidence in medical literature over the years which confirms the hazards of introducing ultrasound or any other form of energy inside the skin. The surgeon must establish exactly the frequency and power of the ultrasounds used, and also ensure the equipment can handle the procedure. To minimise this risk only smaller pockets of fat should be treated and the doctor should avoid removing large amounts of fat. Energy-assisted lipo is often billed as having faster healing times when compared to traditional liposuction, but the difference is often just a few days in regard to draining. The technique also boasts of reduced compression garment time, but as the risks are so high, many people are asking themselves if it is really worth the hassle. While all surgeries carry risks, tumescent liposuction, mastered by Dr Gupta, is the safest procedure available. The tumescent anesthesia solution shrinks the capillaries reducing surgical blood loss, ensuring one of the major benefits is the elimination of the need for pain medication after the procedure. The tumescent solution breaks down fat further, making it easier to be removed without the need for any heat to be applied. Microlipo uses microcannulas to remove the fat in a slower, but more uniformed approach compared to any other form of liposuction, resulting in a smoother finish, with rapid healing. Comparing cannula sizes. 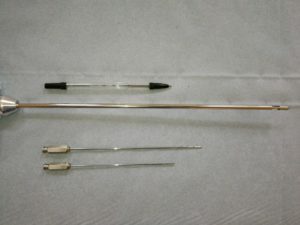 A regular biro next to a traditional liposuction cannula next to microlipo cannuals. The use of microcannulas, less than 2 mm, is a defining feature, unlike other liposuctions liposuction where the cannula diameter is greater than 4 mm. Finer instruments always mean less tissue trauma, which leads to faster healing. Dr Gupta believes the tumescent technique gives the best results in terms of patient comfort, short healing times and with practically no post-operative visits. Before deciding to go ahead with any liposuction it is worth considering all the risks involved. Dr Gupta will discuss the procedure in depth, explain what is involved and also assess your suitability and any risk factors, helping you to make an informed decision. This process will include an evaluation to determine if you have any health problems that might increase the risk of surgical complications. The risk factors differ for each patient, so it needs to be done on an individual basis, but you can be assured of one thing, our clinic will not be exposing you to any form of energy-assisted lipo. We hope this guide has been informative. Contact us today for a free consultation.